This week marks the last week of school for the kiddos before vacation. So, anything I need to finish while they are not here better get done! I have a bit of sewing to finish up and a bit of knitting, but they are all easy quick projects and I am (I think) on target to get things done for Christmas. We have a just a bit of shopping to do (my son would like PVC pipe and duct tape in different colors for a gift – don’t ask…) at a couple of stores not on my normal errand routes, and a bit of baking (the more “for fun” kind, all of our Christmas goodies are finished, but we may make a gingerbread house, decorate cookies together for the lunch boxes and gifts and make some candies if we are in the mood). We tried our hand at gluten free lefse this weekend. It worked out pretty well. I do need a lower edged griddle so I can get the lefse into the pan without wrinkling, but it was a pretty easy dough to work with and tasted like what I remember. My sister, who can eat gluten, is going to go get some “regular” lefse and eat it to see if it is as close as we think (such a sacrifice! Ha!) I have no pictures, because they got eaten as quickly as I could make them. I am going to make another batch this week when everyone is gone so I can freeze them for Christmas Eve and Christmas day. If any one is interested in the recipe, please leave a comment and I will post it. I love this time of the year and all the anticipation and preparations leading up to Christmas. My youngest has been coloring the Advent Coloring Book pages each day which we are then putting into a book (using scrap-booking paper I had laying around for the covers) to read on Christmas Eve and coloring decorations for the house. All the kids have helped with the baking (and tasting) of the treats and have already laid claims of what they get to prepare for our Christmas Eve dinner. The kids are whispering and giggling, putting finishing touches of what they are making for each other, rearranging the nativity scene over and over, and playing Christmas music on the piano. Christmas music is playing and we have watched “The Muppet Family Chirstmas” countless times. This year just feels so peaceful and not rushed. I feel like we have kept the focus on the joy and real meaning of Chirstmas and the amazing gift we were given and I feel very humbled and blessed. 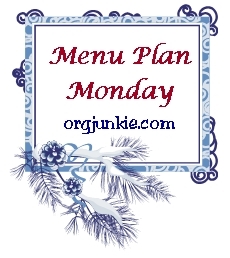 Head over to Laura’s for Menu Plan Monday. She had some trouble with her new crockpot last week, so is looking for some advice on that (overcooked meat is yucky!) and has the Family Favorites option up this week, so you are sure to find some tried and true recipes. The Gluten Free Menu Swap is being hosted this week by In My Box, and they have chosen nuts and seeds as the theme ingredients for the week. I love the nuts and seeds they usually show up at every meal: on salads, mixed into bread dough, as an egg replacer (flax), and to make cashew “cheese” sauce. Yummy! Friday: Kindergarten sing-along(9:45 a.m.)/5th grade sing along (2 p.m)/Last day of school before vacation!! And, finally, one more thing to share. I received an email from one of my students, Cheryl Gray. Her family needs to be gluten, dairy, egg, and yeast free and she has adapted one of my bread recipes to work for her family. She graciously has allowed me to share it here to reach others with the same needs. 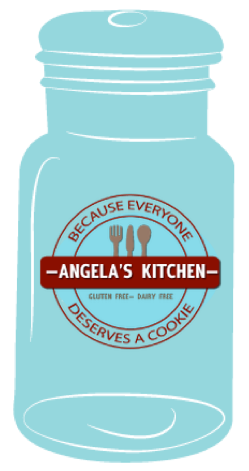 I am really excited about this and will be baking it up today. Thank you so much, Cheryl! Put ingredients into stand mixer according to manufacturers directions – mine is liquids first. This will be pretty sticky – more like thick cake batter. Divide batter in half and place into 2 well oiled bread pans. Drizzle the top of the dough with additional oil and smooth out with your oiled hands or an oiled spatula. Or you can use Rice Milk instead (or any other safe “milk”) for an “egg” wash to keep the crust from getting too hard. Score the top of the bread dough with sharp knife making a cut the long way on the dough about 1/8″ to 1/4″ deep. This will create that split – to give the dough a place to expand. If you don’t, it will expand any which way it can. Cover pan loosely with an oiled piece of plastic wrap and let rise in a warm place for 30 minutes. Either in the oven on warm or on top of a cooking oven over the vent. **If using the Baking Soda and Lemon Juice instead, don’t let it rise, just put it in the oven. Place into a 400 degree oven and bake for 60 minutes. I'm so glad your Christmas prep is going so well! It's really lovely when you can just get into that joyful zone where you're still getting everything done but instead of being stressed out you get to connect with the reasons for the holidays. Thanks for posting the bread recipe - between my GF and my boyfriend's vegan, plus with no yeast as an added bonus, this recipe sounds perfect for us! I will definitely be giving it a try. Hi! Thanks for stopping by! I've got the lefse recipe up now. My family thought it was good, texture and taste. Hope it works out for your family! Next year I have to figure out krumkakka... Now THAT scares me!